Who would have thought that, as they were watching a sparsely attended play reading in 2001 at the new Village Theatre in the Hudson Train Station, they were watching a musical which would play before an estimated audience of many thousands four years later. The musical play, "Music of the Stars", got its start then and today, produced by the new Theatre Panache, it has just finished a successful run in Montreal's DB Clarke Theatre and is headed for sold out shows in Toronto and Ottawa. Theatre Panache is the new non-profit theatre company started by Village Theatre founder and former artistic director Heather Markgraf-Lowe. Its mandate is to promote new talent and produce and tour new Canadian work. In addition to touring "Till We Meet Again", Theatre Panache operates a studio in Hudson where it runs theatre classes. In 2002, the residents who had seen the reading made sure they saw the first real production of Music of the Stars. It featured a mix of local cast members and professionals from Montreal and was fun - good music, singing and a bit of dancing. Seniors loved it for the memories. Baby Boomers loved it for the history, the songs and the dancing. Kids loved it because it was about their grandparents. The show did very well. In 2003, many people who had seen the show in 2002 made sure that they had tickets for the latest version of Music of the Stars. The show was again directed by Heather Markgraf-Lowe and was now mounted with an all-professional, Actors' Equity cast and supported by a Canada Council grant. The budget had doubled and the result was a really polished show which was again a huge success and made a profit for the Village Theatre. 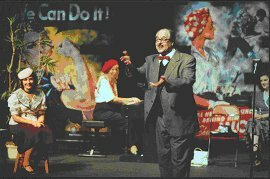 Fast-forward to 2005 - the show has been re-worked by David Langlois and it is now a sleek vehicle for war-time songs and a back-story about the people who were in the CBC show. Now called "Till We Meet Again", the show is scheduled to tour Montreal, Toronto and Ottawa. It has the support of the Canadian War Museum and Canadian Veterans Affairs and, including their contributions, the budget is over $200,000.00. The show opens in Montreal at Concordia's DB Clarke Theatre and ticket sales are initially slow. Then word gets around and the box office can't handle all the calls. People arrive an hour before show time to make sure they get tickets. The theatre runs out of commemorative programs. The shows all get standing ovations. Some of the Toronto shows are already sold out. Montreal and Hudson residents who couldn't get tickets to the show should reserve early for one of the Ottawa shows at the new Canadian War Museum. It is especially interesting for Hudsonites who have attended previous versions to see how the show has grown and improved. In addition to a spectacular set, the show now has uniformly good singers, a lot more choreography and a compelling back-story about the characters who are in the CBC show. Costumes are also outstanding, especially in the second act. Hudsonites who have been supporting the Village Theatre for many years must be gratified to see how well one of the shows developed there is doing in the Canadian Theatre scene.